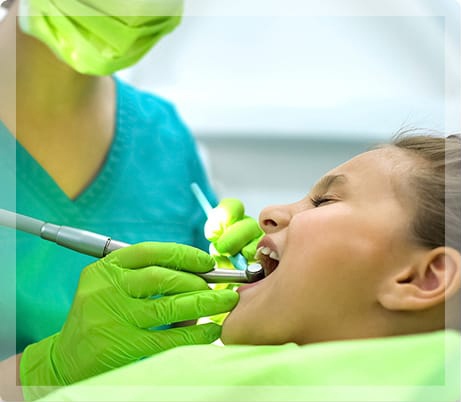 The professionals at My Pompano Dentist in Pompano Beach, Florida have advanced training and years of experience in reconstructive (restorative) dentistry. Reconstructive dentistry can be fairly simple, such as when a patient needs a single procedure like a crown or dental implant, or complex, as in full-mouth reconstruction. A crown is a restoration that is placed on a tooth that has lost a lot of its structure, such as a cracked or broken tooth. They are also used to protect teeth after a root canal and to complete a dental implant. Crowns may also be used to securely attach a bridge if the surrounding teeth by themselves are inadequate to do so. In our office, we offer porcelain crowns in a single visit. Getting a crown typically requires two visits when the crown is made at an external lab. But we can make a custom-fitted crown for you on site. It will match the color of your adjacent teeth for a completely natural look. A bridge is a dental appliance that is used to replace one or more missing teeth. The most common type of bridge is made by attaching an artificial tooth to a crown on either side of the space. It is designed to be cosmetically appealing and also to restore a proper bite (occlusion). At My Pompano Dentist, both dental crowns and dental bridges are created to match the color, height, texture and overall appearance of your teeth. Most crowns and bridges will last for life, eliminating the need to replace them unless they fall out or become loose. Dental implants are another restorative solution for replacing one or more missing teeth. They can also be used to attach partial or full dentures. Learn more about dental implants. If you have extensive damage to your teeth, gums, and jaw, Dr. Browne and Dr. Thayil can reconstruct and restore your smile so it is not only functional but attractive and natural-looking. You may need full-mouth reconstruction if the majority of your teeth in either your upper or lower jaw, or both, are missing or damaged from decay, infection, or trauma. Full-mouth reconstruction involves multiple visits and procedures over time. Our dentists will conduct a thorough evaluation including a visual exam, X-rays, and 3D cone beam CT scan to assess the extent of the damage. They will determine which teeth can be saved and which need to be replaced. They may also need to consult with an oral surgeon, periodontist, and/or orthodontist to devise a comprehensive treatment plan. Treatment options may include a combination of crowns, bridges, implants, veneers, braces, and jaw surgery. Depending on what all needs to be done, it could take up to 12 months to fully restore your teeth and smile. Like our many delighted patients, you can trust in our dentists’ expertise to deliver the results you desire. To learn more about these and other reconstructive dentistry solutions available at My Pompano Dentist, call our Pompano Beach office at (954) 941-2412 or use our online form to request an appointment. We offer affordable payment plans and several no-interest financing options.